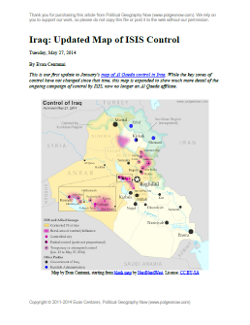 This is our first update to January's map of Al Qaeda control in Iraq. The map has been expanded to show much more detail of the ongoing campaign of control by the Islamic State of Iraq and al-Sham (ISIS), now no longer an Al Qaeda affiliate. This map and article are exclusive premium content, available only to members or for individual purchase. Buy now (US$9.99).